Israeli soldiers abducted, Friday, three Palestinians from Jabal al-Mokabber neighborhood, in occupied East Jerusalem, and issued orders barring seven women from entering the Al-Aqsa Mosque for one week. Media sources said the soldiers abducted Amer Mahmoud Mashal, 33, Luay Mohammad Salama, 27, and Hasan Salama, 45. 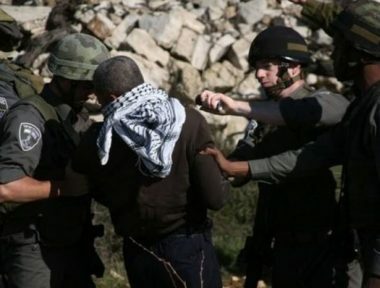 They added that the three Palestinians were cuffed and blindfolded, before the army moved them to a detention and interrogation center in Jerusalem. In related news, the soldiers issued orders barring seven Palestinian women from entering the Al-Aqsa Mosque, for one week. The women were detained, on Thursday evening, while leaving Al-Aqsa, and were sent to an interrogation facility, before being released later. They were also ordered to head back to a police station, next Thursday, for further interrogation. In addition, the army released Fadi Oleyyan, one of the guards of the Al-Aqsa Mosque, one day after abducting him along with many Palestinians, including several guards of the holy site.